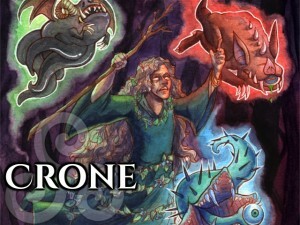 Crone, a fantasy RPG card game, has posted up a preview of their upcoming Kickstarter campaign and are looking for your feedback on how things look. CRONE RPG has launched a "pre-funding" campaign for their upcoming tabletop roleplaying card game, Crone. Interested gamers are encouraged to leave their advice, feedback, and questions on the campaign in anticipation of it's March 15th Go-Live on Kickstarter. In Crone you are a wizened old witch of great power and fearsome reputation. Your magic will shake the very foundations of the earth.